TAIL DESIGN: The STOL CH 801 tail sections are designed to provide maximum effectiveness (control) at slow speeds and at high angles of attack. The aircraft features an all-flying vertical tail (rudder) section for excellent effectiveness and control, especially at low speeds. 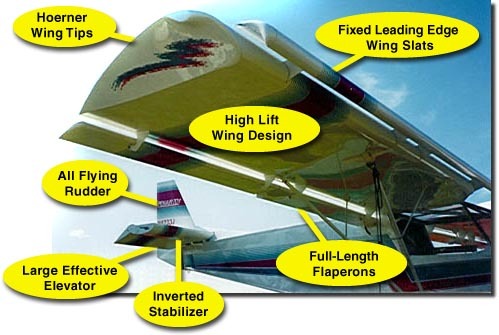 The all-flying rudder provides responsive rudder control, while also minimizing weight and complexity (theres only one vertical tail section). Two rudder bearings bolt to the rear fuselage to fix the rudder to the fuselage. The horizontal tail sections are made up of the elevator and the stabilizer. Both these sections are unique and developed specifically for maximum effectiveness at low speeds and at high angles of attack. The stabilizer is an inverted airfoil section to maximize downward lift to help achieve high angles of attack required for short take-off and landing performance. The elevator is an actual airfoil section, and provides a virtual venturi effect when deflected down, as illustrated below. The unique tail sections provide maximum effectiveness for short take-off and landing performance  while also minimizing the actual size of the tail sections. The STOL CH 801 makes use of highly engineered design features for excellent STOL performance, and importantly, responsive control at low speeds. 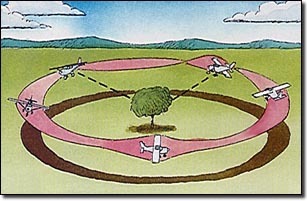 While many aircraft designs often boast a low stall speed, many of these same designs have minimal control effectiveness at these lower speeds. The STOL CH 801's large effective control surfaces provide excellent controllability at very low flying speeds - a necessity for effective short take-off and landing performance - while being very light and balanced.